I had a number of these last year and now they're starting again on a new site. Last edited by mandville on Sun Aug 12, 2018 7:57 am, edited 1 time in total. Re: Googlebot? looking for strange urls.. Yes; I see a few of these links (they're called "referrer spam" in some circles) most days on websites that I own or manage. See also viewtopic.php?f=714&t=958501. Also search for "Who's snooping around your website?" on Google. A number of counterfeit bots masquerade as Googlebot. Check the source URLs to determine if they're real or fake. unwanted pages like these in just a week while I was away. You need to control it because if Google flags your site as "Hacked", it won't be easy for you to recover your rank. I suggest you to scan your site with Sucuri and contact your host regarding this issue. These days web hosting providers remove or suspend your site without any prior warning if found hacked so it's good to make them aware of the situation before any mishappening. You need to control it because if Google flags your site as "Hacked", it won't be easy for you to recover your rank. That's rubbish! Google does not flag websites as hacked. Google does flag websites as suspicious or deceptive. There's a big difference between a deceptive website and a hacked website. There is no such thing as a "rank" in Google. 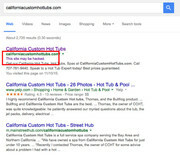 SERPs are ordered according to Google's own algorithm. Sponsored websites (i.e. where you pay Google to promote your products) usually have better SERPs than non-sponsored websites. The idea of page-ranking is a myth; Google does not use "page rank" ... full-stop, end of story. Most likely the website in question is not compromised, hacked, suspicious or deceptive. There is no evidence to show that the "googlebot" activity has accomplished anything; there is no evidence to prove (or disprove) that the cited URLs have been indexed by Google. As I wrote earlier, this looks like referrer spam to me. It is true that reputable web hosting providers may suspend a website that's affected by malware or other contamination. That's certainly true. We don't know and we cannot judge what we don't know in this case. You've got issues man! First of all you are spamming on all of my posts, and secondly you don't even know how to talk to someone. And you are saying there is no such thing as "rank" on Google? Dude, you need to spend some time learning how SEO works instead of getting into cyber fights with others. I don't see how this helps the OP with their question. Looks like your site is compromised. There is no evidence that the OP's website has been compromised or not; that's all I was trying to say. If you're willing to help then please remain on-topic and don't conflate your own problems with those of the OP. Thanks. You could be right. The site may be have been compromised—successfully attacked by someone. I don't know if my theory—the site log shows a benign trail of unresolved 404 pages—is any closer to the truth, either. The problem we both have is that the OP hasn't provided any feedback for more than two weeks and, under these circumstances, any opinions we may have are idle speculation. Rather than indulge in our speculation, we should probably leave this alone. Isn't it curious when I look at the Google result for that hot tub business? The site isn't hacked for me. The telephone numbers are completely different. Hmmm Puzzling. Last edited by sozzled on Sun Aug 12, 2018 6:49 am, edited 2 times in total. Apologies for not coming back here sooner. The website I posted about is not hacked or compromised in any way, and never has been. Referrer spam is the likely culprit as "Sozzled" has posted. Strangely, they weren't indexed but google keeps looking for them (Search console) and returning them as crawl errors, if I deleted them from their list, they came back again. Not sure how that was happening, as they're of course not pages they could not have been picked up. Since I posted here, I got a huge list of spam referrers and bots and put them in htaccess (with reservations re. slowdown). Now they've stopped appearing in G. Search console and joomla redirect component-404's. Thank you for the helpful comments "Sozzled". Last edited by Champenois on Sun Aug 12, 2018 7:12 am, edited 1 time in total. Thanks, @Champenois. No problems here.